You will have all read about Gillian Gibbons, the Liverpool teacher working in Sudan, who was sentenced to 15 days in prison followed by repatriation yesterday. Most seem to agree that what she did was simply a misunderstanding of Islamic sensitivity to the use of the name Mohamed for the class teddy bear. However, in Sudan a teddy bear is not regarded as a cuddly symbol of mercy but rather a representation of an animal. Clearly the incident infuriated many hard line clerics, some of whom were calling for Mrs Gibbons to be executed. The normal punishment for the crime would have been 40 lashes and a term in prison. The Sudanese judge obviously felt that the sentence passed was as lenient as he could impose. The point is that Mrs Gibbons was living in a "hard line" Islamic country and should possibly have been more aware of the implications of that. We live here in a predominantly Catholic country where religion assumes a much greater importance in people's live than it does in much of the UK. It's a fact which we need to be aware of. I doubt that anyone would be punished for calling a teddy bear Jesus in Spain but it would probably be regarded with disdain. When you live in a foreign country, you don't necessarily have to adopt the culture but you do have to be at least sensitive to it. I'm sure that Mrs Gibbons will have learnt that lesson well by the time she returns to the UK. Khadra Bekedda Lazreg, a student from " San José de Calasanz " school in Bigasro has won in the primary section of the competition "Defensor del Pueblo 2007 ." This competition, open to students in primary and secondary schools throughout Spain, was for drawings on the theme of "Human Rights". The eight winners, along with their tutors and directors will visit the Congreso de los Diputados on the 10th of December where D. Enrique Múgica Hergoz, President of the Defensor del Pueblo will present them with their prizes. If one of my "A" level Art students had produced that drawing I would have been proud. Khadra obviously has a lot of talent. On Friday 30th of November, the World-wide Day of the Fight against AIDS, the Council of Social welfare of the City council of Bigastro has planned to provide information in the City council and the Institute of Secondary Education Miguel Hernandez about the disease. In addition there will be a distribution of promotional material aimed at informing the population, in particular young people, about AIDS. The leaflets will help them to understand the disease and the most frequent routes of transmission etc. I posted an item of gossip on Saturday about the land opposite Calle Holandia which is currently an unused orange grove. It has been suggested that the land is going to be built upon and that the small fenced area will be used to store equipment and materials. At the seventh anniversary dinner of the Association of Promoters of the Vega Baja (Procosta) the President, Antonio Navarro said that construction in the region is registering a deep crisis because the sale of houses had dropped dramatically over the last two years. However, the observant ones will have noticed that the steel storage container, that was on the land opposite Aurelio's house, has now been moved to the cleared plot on the corner. The question is - does this mean that building is going to start on the orange grove or is Aurelio clearing the plot opposite his house ready for building there? There is still the old generator which was used to provide electricity for the estate along with the oil tank that fed it to be moved. If they go then my bet would be on a house opposite Aurelio's. Don't quote me yet but just watch this space! Forecast of winds of up to 70 kms/h later in the day kept fishing boats from Jávea, Benidorm, El Campello, Guardamar de Segura and Torrevieja in harbour today. The strong winds are expected to continue until tomorrow. Between the 30th of November and 2nd of December, Bigastro will play host to this competition at the Auditorio Municipal "Francisco Grau". This year the Sociedad Unión Musical de Bigastro and the Sociedades Musicales de la Comunidad Valenciana (sponsored by the Concejalía de Cultura del Ayuntamiento de Bigastro) have the pleasure and the honor to organize and present this prestigious event. Throughout the weekend (mornings and afternoons), about 200 students, finalists from the 21 Musical Societies of the Vega Baja and Baix Vinalopó, will participate in the different categories both as individual and in groups. The judging panel will be made up of prestigious musicians, presided over by the Honorable President, D. Francisco Grau Vegara and the President, D. Manuel Gutiérrez Lopez. According to the Sun newspaper, Britain's top judges have been put at risk after two CDs with their personal details were sent out in the POST. The discs, containing 55,000 separate files, also had highly sensitive information about hundreds of barristers and solicitors. Magistrates were also named along with county councils, government departments — and almost every police authority in the country. The discs even had details of Prince Charles’s Duchy of Cornwall Estate. The information included bank account numbers, sort codes, and home addresses. It would have put those named at massive risk from identity theft and fraud. Freelance project manager Frank Milford was hired in October 2006 by the Department of Constitutional Affairs to overhaul its financial management. Frank called up Liberata, an outsourced firm which handled all the Department’s finances, and asked for a list of suppliers expecting to to get company names and invoice details. Instead two CDs arrived by post to his home containing every person, business or company ever paid by the DCA over the last five years. The CDs were not encrypted and had no password. And the package was not even sent recorded or registered post. Dozens of judges, Lords and Ladies, professors, doctors, coroners and medical experts appeared on the list of people on the CDs. Many addresses, phone numbers and email details were recorded alongside bank information. Incredibly once Frank’s work was finished in July, he was not even asked to hand the CDs back. The DCA is now the Ministry of Justice and Secretary of State Jack Straw is certain to be infuriated by the breach. Imagine how much those CDs would be worth in the wrong hands. I just hope that Frank has got rid of them before "Burglar Bill" decides to pay him a visit. 40% of the teachers in the Valencian Community are demotivated and 7% are considering the possibility of looking for alternative work according to a survey gathered in the report of the Defensor del Pueblo. The main reasons given are, interruptions by the students in lessons (100% of teachers in the survey) and the lack of respect shown by students towards them (82.3% ). Other factors included; the lack of participation by families in the education of their children (37.3% of the teachers), student learning difficulties (36,3%) and aggressive behaviour between students (23,3%). If you surveyed English teachers you would get almost identical results. It isn't the newspaper headline behaviour that causes most grief for teachers, it's the low level disruption that wears them down. As for lack of respect. Don't get me started on that topic! Some of the children I encountered showed no respect for their parents, for people in authority, for their teachers, for their peers even for themselves. One factor that the English teachers might add though is lack of support by parents. 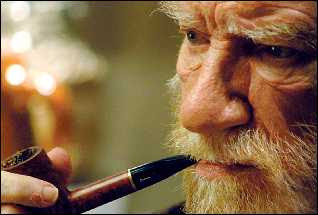 Increasingly, parents in England will blame the teachers rather than their children for things that go wrong in school. he also played Johnny Mercer and Henry Mancini's "Moon River" as an encore. including theme tunes from the films Jaws, ET, Star Wars etc. The concert was absolutely brilliant. The soloists were exceptional and the audience were delighted with it all. La versión de la sonata para trompeta y orquesta de cuerda en re mayor para banda que hoy escuchamos ha sido instrumentada por el propio solista. Antonio Rodriguez Pérez es músico polivalente, paisano nuestro, que ha destacado corrio compositor, instrumentista, director de coros y profesor de las asignaturas de Armonia, Contrapunto y Composición del Conservatorio Profesional de la Ciudad de Murcia, donde actualmente reside. - Florencio Sáez es un prestigioso pianista bigastrense que ocupa la cátedra de armonia del Conservatorio Superior de Música "Oscar Esplá" de Alicante. Es desde 1994 director musical y pianista acompaňante de la agrupación "Galas Liricas" que fundó el prestigioso baritono Guillermo Palomar, k.on un amplisimo repertorio de ópera, lied y zarzuela. Ha acompaňado también a grandes jóvenes valores de la lirica espaňola a lo largo de toda la geografía national, con un total de más de doscientos conciertos en los ú1timos aňos. Anoche, la interpretación musical fue absolutamente brillante. Los solistas estuvieron excepcional y el auditorio se encanta de todo. Pam and I are not fond of passing on any of the many rumours that we hear. For one thing, they are mostly misleading and in some cases downright harmful. However I couldn't help but be tickled by this one, so I have to share it with you. The rumour starts by saying that Aurelio Murcia, who built Villas Andrea and lives here, has bought the land opposite Calle Holandia with the intention of building more houses on it. He was apparently seen with a clipboard looking over it some time ago - a sure sign, if ever there was one, that he must have bought it. According to the rumour, the small plot of land on the corner, which was cleared and fenced off some time back, is where he intends to store materials and equipment for the construction of the houses. The observant ones will have noticed that the small plot has been cleared again. Does that mean that construction on the larger plot is imminent? If you really want to know, my suggeston is that you go and ask Aurelio himself but remember he is a politician, so may not give you a straightforward answer! Actually I have a better plan. Let's just wait and see - "que sera sera". We all know how Chinese whispers work; especially here at Villas Andrea. On Saturday the 10th, I posted an item about the butchers we go to near Mercadona. They'd been visited by Health and Safety inspectors who told them they couldn't sell products without proper labelling in Spanish. Last week I was told by a neighbour that Reeve's weren't allowed to sell sausages and pies anymore. You will note the subtle but significant difference in the story. The tale now implied that there was something wrong with the sausages and pies that Reeve's sell. NOT TRUE. I'm pleased to say that, following a second visit by Health and Safety inspectors, sausages and pies are now back on sale at Reeve's. Furthermore they can also sell products from the freezer cabinet again. Interestingly though, the sausages and pies are not out on display in the shop. The reason we were given was because there wasn't enough space for them now that there are joints of meat for Christmas on display. In a scenario, which reminded me of newsagents who kept adult magazines, we were told that the sausages were under the counter. I could almost imagine the butcher looking both ways to check before drawing customers close so they could hear him whisper "want any sausages mate?" Those of you who frequent other purveyors of meat can expect similar problems in the future as the Health and Safety inspectors do the rounds. Don't worry though, it won't mean that the meat they sell is dodgy; just not labelled correctly. PS I'd like to bet that the neighbour either read the original story on my blog or heard it from someone else who had. Following the concert tonight by the Sociedad Unión Musical de Bigastro at the Auditorio Municipal "Francisco Grau" in Bigastro, you can visit Torrevieja to listen to its town band on Sunday. The Unión Musical Torrevejense will be presenting their concert to honour Santa Cecilia in the Municipal Teatro-Auditorio at 12:oo noon. Entrance will be free by tickets which can be obtained from the ticket office at the Auditorium. Please note the new opening hours for the Ayuntamiento in Bigastro starting Monday, 26th of November. A group of residents in Villas Andrea have decided that, instead of sending Christmas cards to all friends and neighbours, we will make a donation of the money saved to AECC (sometimes known as Contra Cancer) to help their appeal to purchase a new, very advanced scanner for breast screening. Thank you in anticipation for any donation you feel you want to make towards this very worthwhile and important appeal. Wishing you joy and happiness at Christmas and throughout the New Year. Sounds good to me. Just think you won't have to buy the cards, write them, deliver them and then worry about whether you have missed someone out. Go to the paper's website and click on the ONLINE PAPER menu at the top of the page and you can view any or all of the editions of the paper as they are printed. Once you have selected a paper to view, you'll find a navigation bar at the bottom which allows you to choose a particular page or move forward and backwards through the paper. To give you the feel of having an actual paper though, RTN have incorporated a snazzy feature which allows you to use your mouse to turn the pages. As you hover over the top corners they start to curl. If you then drag the corner, the page will turn with your mouse. Once you have the page you want; a click of the mouse will bring up a full size version for you to read. All very clever stuff. So, if you miss getting a copy of the paper, or you want to see the other editions, they are all there waiting for you at the click of your mouse. PS I forgot to mention; at the very top of he screen you will see three buttons; red, blue and green. Click on those and you can change the background colour of the web page. Come on Round Town News, even for me, that feature is a bit over the top! Research has shown that one in seven children in Britain have tried cannabis before the age of 13; more than three times the EU average. The report also said that the growth of cocaine use in Britain and Spain had proved to be a precursor of a new boom in cocaine use across Europe. The market has grown by a million new users in the past year alone, making it the second most popular illegal drug after cannabis. Spain has the highest level of cocaine abuse out of 29 countries across Europe, with consumption levels similar to the US. In Spain, 5.2% of young adults aged 15-34 say they have used cocaine in the last 12 months, compared with 4.7% in the UK. Spain also has the highest proportion of cannabis users among people aged 15-34 at 20% compared with the Czech Republic 19%, Italy 16.5% and Britain 16.3%. Britain, though accounts for most of the children under 15 who go into drug treatment each year, with 2,251 out of the 3,237 new patients in Europe, the latest figures show. The number of young British children in treatment, mainly for using cannabis or sniffing inhalants, has grown threefold from 797 in 2000. The only crumb of comfort in the report is the "cautious optimism" expressed about the use of cannabis. The European market apparently stabilised in the past year, with about 3 million using it on a daily basis and signs that its popularity among the young is waning. There are plans to build an artificial island costing an estiamted 5,000 million euros at Valencia. The promotional video for the project shows a circular island very similar to those already built off Dubai. Apparently 0.12% of motorists in Spain (30,000) never formally learnt how to drive. Whilst thirty years ago this was overlooked, from the 1 of May; refusal to obtain a proper licence, failure to renew outdated licenses, ignoring temporary suspensions or loss of all of their points will incur either three to six months in jail or a substantial fine for errant drivers. They may also be forced to have meetings with victims of accidents. These measures are introduced after the six month moratorium which followed the introduction of the new Penal Code. Driving at 110kms per hour in cities, 180 on highways or 200 on motorways will result in a jail sentence of up to five years and a suspension from driving of up to 10 years. Similar sentences will be passed for drivers with 1.2 grams of alcohol per litre of blood or who are found to be driving under the influence of drugs. Most of the sentences of less than two years where no one is inured and there is no personal damage will be replaced by enforced meetings with the victims of traffic accidents or the families of deceased. The Act also penalises drivers who refuse to take test for alcohol levels or drug detection. Refusal will carry a one year prison sentence. One of first to react to the news was the minister of Culture, Caesar Antonio Molina, who emphasized that Fernán-Gómez included throughout his life all facets of the theatre from interpretation, to writing and direction. Yesterday, the King and Queen and the Princes de Asturias sent individual telegrams of condolence to Emma Cohen expressing their feelings of great sorrow to the actor's children. Don Juan Carlos and Doña Sofía said the multitalented figure of Fernán-Gómez; actor, director, academic writer was outstanding and emphasized that he had been a key figure in Spanish arts over the last sixty years. Jose Luis Rodriguez Zapatero, also sent a condolence telegram to the family emphasizing that ", nobody has provoked greater admiration amongst their own companions and all the Spanish society " After expressing his " deep feeling of condolence ", Zapatero emphasized that their work and its figure " are essential to understand the contemporary Spanish culture " . The president of the PP, Mariano Rajoy, said that Fernando Fernán-Gómez leaves an inheritance which, without a doubt, all Spaniards are going to learn ". The Anti-corruption Office of the public prosecutor has sent to the courts in Orihuela two denunciations, dated the 21st of March and of 4th of July, against the socialist mayor, Jose Joaquin Moya, for presumed prevarication and embezzlement. The mayor is accused of having council workers do some construction work at his home in Jacarilla. The mayor is also accused of making an illegal concession to the company Euroner to build a solar farm on the rustic ground at the Pedrera. According to the denuncia , the auction for the land did not follow the legally established procedures. 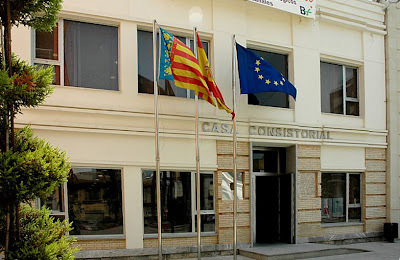 The building work at the Pedrera was stopped by order of the Conselleria of Territory a few months ago. These people never do anything by halves. 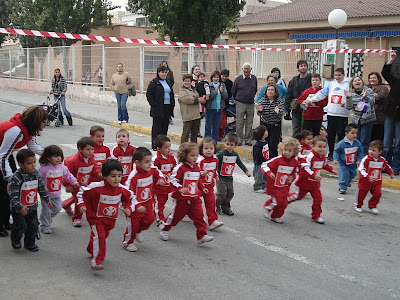 On Tuesday the infant school La Paz organised a race supporting the idea of childhood. As you can see, the children all had tracksuits with "Save the Children" logos on the front. They ran around the streets by the school under the watchful eye of parents and grandparents and then tucked into drinks and snacks. I bet it was a lot of fun. I don't suppose it mattered who came first because they were all winners. Alistair Darling, the Chancellor, admitted yesterday that names, addresses, birth dates, national insurance numbers and bank account details of every child benefit claimant in the country had gone missing. The confidential material sensitive ,which includes personal details of 25 million Britons, is on two CDs. These were placed in the post by a junior employee at the HM Revenue & Customs office in Tyne & Wear more than a month ago and have not been seen since. The Chancellor and the Prime Minister have known about the loss since November 10 but there were concerns last night that the police were not told for a further five days and the banking industry was not alerted until last Friday. The catastrophic breach of personal security led to the resignation of Paul Gray, the chairman of HMRC, and called into question the Government’s competence, especially its ability to manage an ID card system in the future. No evidence of criminal activity has been detected but Scotland Yard has appointed an expert in organised crime to head the investigation. Acting Assistant Commissioner Janet Williams is heading a team of 12 officers who are combing Government offices for the lost data. The Serious Organised Crime Agency is also advising on the potential criminal abuses of information about the identities and finances of 7.25 million British households. Equipped with such detail, identity thieves could plunder bank accounts, obtain credit cards and take out fraudulent loans. Households were advised last night to monitor their bank accounts carefully for signs of irregular activity and, if necessary, to obtain credit reports. It is said that criminals would pay around £2.50 for the personal information of each person involved. So if everyone's information on the CDs were sold, they could fetch over £60m. Taking into consideration the fact that the average victim of fraud looses £15,000, the potential loss could amount to billions of pounds. The banking industry has upgraded its fraud detection systems to keep a constant watch on all accounts into which child benefit is paid. According to the Spanish newspaper El Pais, this is not the first time a problem like this has occurred. There have been four other occasions when data was sent by unsecured delivery, via the courier TNT, dating back to last March. You may have noticed on the left hand side of my blog a box under the heading "Blog Statistics". In the box are figures which show how many page loads my blog has received and how many unique visitors. Currently 20,126 page loads by 8,000 visitors. The linked site also show me other stats. e.g. which are the most active countries, what operating system people are using and the screen resolution they are viewing at. Interestingly, the most active country now is Spain ( at 40.62%) which has pushed the UK (currently 37.36%) into second place. Surprisingly, USA comes third in the list with 11.93%. Even stranger though, I have had visitors from 63 countries including Nepal, Kuwait and the Maldives to name but three. Perhaps they were curious to know what sort of hen laid a 171gm egg! Windows XP is top of the operating systems by a long way and Internet Explorer continues to be the browser of choice by readers. So wherever you are and whatever computer you are using, thank you for reading my blog. As the Americans might say "be sure to drop by again". I received this comment today in response to the item about the concert on Saturday. I'm pleased to read and follow your blog , not as regular as I would like, to know what it is happen in Vega Baja and specially in my town Bigastro. Only I want to give you thanks to publish and recollect all the news that you show in this blog concerning Bigastro, Vega Baja and your own hobbies. It is very interesting to know a lots of things , like who is the owner of pedrera restaurant or your opinion about new corteingles, because I work away from Bigastro and I only visit it once a month. So, I encourage you to go on and grow up this corner in the digital world. Congratulations for your blog. I know that a lot of English people, both here and in the UK, read my blog. It is good to know that I also have a Spanish audience. Thank you very much Joaquin for your comment. I'm delighted that you find my blog interesting. PS perhaps I ought to try and write some of the items in Spanish. That would certainly be a challenge for me! It's not just an English problem. All over Spain, large groups of teenagers join together at the weekend to consume cheap drinks with the intention of getting as drunk as possible, as quickly as possible. These group parties are known as el botellón. In some regions there has been an attempt to ban the gatherings which has met with varying degrees of success. A survey in Alicante however, seems to indicate that the vast majority of teenagers on the Costa Blanca have more interest in spending their money on clothes and mobile phones than on binge drinking. The ONG Club, who carried out the survey, said that this isn't because Costa Blanca youth don't go to el botellón parties; it is that Alicante teenagers are using the gatherings to have fun without the drunkenness. Of course, it may just be that el botellón has been severely reduced in Alicante by the introduction of a 90 euros on-the-spot fine for anyone caught drinking alcohol publicly. In Summer we could hear young people up on the Pedrera most Saturday nights at what what we suspected were el botellón parties. Some walked up, some rode up on motos or drove up in cars. Their presence didn't seem to cause us a problem until they decided that it would be fun to kick or push over the service boxes on the vacant plot round the corner. The broken electricity box revealed the supply cables, the gas and water supply pipes were perilously stretched. But more significant to us; the telephone box where our new connection had been made was broken. Fortunately the cables to the box and to our houses were intact. The cold weather seems to have put an end to the late night parties so hopefully our newly repaired box will remain intact. The Association of Progressive Women of Bigastro has organized a bobbin course to teach people how to make traditional lace work. The association organizes these courses is to ensure that the art of bobbins and the characteristic patterns of the Vega Baja continue to be practised. The course will held on the ground floor of the Municipal Audience; Tuesdays from 5:30 to 7:30pm. The course is totally free. The concert will feature the Auditorium's new grand piano played by Bigastro born Florencio Sáez Villanueva. You may have already read this report in the local free paper the CoastRider. A week ago on Monday, the CoastRider 5-a-side squad arrived at Camping Marjal with a steely determination, and instilled with a quiet confidence. After one narrow defeat and one thrashing, we were hellbent on preventing a trilogy of misery. There was a no-show from the mosquitoes, sending out a clear message that they had lost faith in our abilities. Our opponents this week were a team from the Bigastro Villa Andrea urbanisation, and we were rather perturbed to discover they actually had a manager. With our opponents having a squad of six compared to our eight, we decided to play six-a-side. This was our suggestion, disguised as an altruistic notion of allowing all their team to take part. In reality, we were hedging our bets by denying our challengers the option of a fresh pair of legs. In our pre-match group huddle we agreed on our tactics. There would be no offside traps, diamond formations or sweeper systems. We would rely on good old-fashioned shouting. And it paid dividends. After five minutes of constant bellowing we were two goals up. It also helped to have our secret weapon in prime form. Tommy Cahill’s combination of youth, speed and skill was too much for the opposition to handle. A plethora of silky runs and deadly finishing saw Tommy net four goals in the first half. Of course, he was also helped in no small part by our ceaseless yelling. The second half followed a similar pattern to the first, with both sides creating a host of chances.Villa Andrea were strong, competent and showed great teamwork but lacked the killer touch to score. Our side, on the other hand, finally found our finishing, with Tommy grabbing a further two and Jason Worland scoring two. This was achieved with a reduction in shouting as our throats had become hoarse from our first half exertions. Even I found myself one-on-one with the goalkeeper yet decided to misplace a pass to the right, feeling that losing possession was a little less embarrassing than skying a shot way over the bar. In fairness, our 8 – 0 victory wasn’t a true reflection of the game. If Villa Andrea had a striker of the calibre of our Tommy Cahill it would have been a much closer match. Towards the end of the game, our opponents looked the stronger and put together a string of good moves. One of the stars of the game was Villa Andrea’s Allan White, who used to play professionally for Chelsea in the Tommy Doherty days. At 67 years of age, his fitness, strength and quick footwork caused our defence many problems. CoastRider’s Barry Wright paid him due respect in the first half by kicking lumps out of him at every opportunity. At one point, our Steve Verity’s competitive edge got out of control when he kicked his team mate, Dan Holmes, up the backside for failing to stay on his feet after being tackled. Dan took in it in good spirit and was soon perfecting his trademark pirouetting panache as he avoided challenge after challenge, culminating in a mazy run and a shot that went inches wide. Another mention needs to be made of our young debutante, Laurence Frost, who was solid and competent in defence. His father, Darren, played the role of referee, yet nepotism failed to cloud his judgement. So, the CoastRider boys had finally tasted victory and positively stank of success. All except Dan, who couldn’t quite rid himself of the aroma of fetid sweat which had impregnated his fingers from his old pair of goalkeeper gloves. We were buoyant and already looking forward to our next match. To borrow a phrase from Stuart Pearce, coined as the manager of Nottingham Forest back in the late nineties, the CoastRider 5-a-side team had finally seen the carrot at the end of the tunnel. At the end of the game, the players from Villa Andrea Urbanisation generously donated 100 euros to the Cruz Roja Ambulance Appeal. 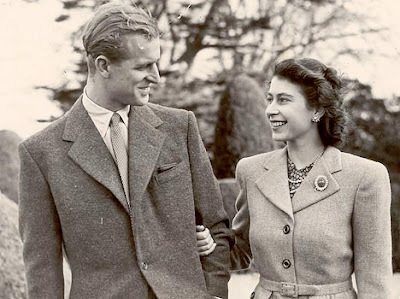 The Queen and the Duke of Edinburgh will celebrate their diamond wedding anniversary with a special service of thanksgiving today. 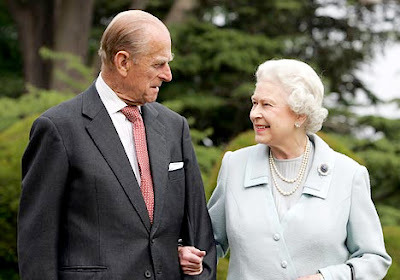 The Queen is, of course, the first British monarch to celebrate 60 years of marriage. Last night, the celebrations began with a special meal at Clarence House where 25 guests feasted on lobster mousse, Sandringham partridge and ice-cream cake with Highgrove berries. Later today the Queen and the Duke will unveil a new Jubilee Walkway panoramic panel in Parliament Square. Tomorrow, the actual day of their anniversary, they will fly to Malta. 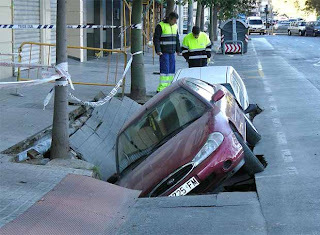 At dawn yesterday, a hole 10 metres long; 4 wide and 1.5 deep appeared in the Paseo de la Petxina in Valencia devouring two parked cars. The vehicles had to be removed with a crane. At the moment nobody knows what caused the road to collapse. They are going to investigate the problem today. For those of us living at Villas Andrea, there is more than a touch of déjà vu about this incident. This weekend we have experienced the coldest night time temperatures so far this year. In Villena the temperature dropped to minus 6. In Alicante and on the coast the temperatures were milder at between 2 and 5 degrees centigrade. The reason for this drop in temperature at night is the combination of cold air coming in from the centre of Europe and cloudless skies. This will change today though as clouds form. The cloud cover at night should keep the temperatures at a more normal 10 degrees. Later in the week, night temperatures are forecast to drop again but not to the levels we felt this weekend. This cold temperatures have brought with them increases in cases of influenza and respiratory problems. The Conselleria de Sanidad have pointed out that people who have not been vaccinated form 80 percent of the cases of influenza reported so far. Guardamar has two treasures lying under its dunes which the town wants to preserve. The archaeological deposits, which lie next to the mouth of the Segura river, have been appraised by archaeologists for their excellent state of conservation. The first of the treasures is the Rábita Califal which dates back to the Islamic times of the tenth and eleventh centuries, and the second is the Fonteta which is a Phoenician urban complex dating back to colonial times between fifth and sixth centuries. Antonio García, the person in charge of the service of cultural patrimony for the town says that it is " one of the best conserved sites in the western world ". Understandably, the City council has therefore rejected any proposal to excavate the sites since they were discovered over five years ago. That may all change though because the Delegation of Alicante has announced that the British Museum has shown " interest " in excavating the sites with the stipulation that their project must guarantee the sites conservation . The managing director of MARQ, Jose Alberto Cortés, visited the site along with Jonathan Tubb, conservationist from the British Museum. Tubbs, an international specialist currently excavating in Syria another Phoenician deposit, was astonished by the quality of the find. So in spite of the towns objections, it looks like both sites may now be excavated and conserved. Almost a quarter of a million Britons have bought homes abroad in the past decade, doubling the holiday home ownership numbers and with the majority buying properties as an investment. Those investments though may prove to be at risk as thousands of euros are wiped off the value of homes; particularly in the Mediterranean. In Cadiz, in south-west Spain, prices have dropped by 15 per cent and in Alicante, on the Costa Blanca, prices have fallen by two per cent in the past three months. One of the reason is that Europe has suffered even more severe interest rate rises than Britain, making property increasingly unaffordable, especially in Spain, where most mortgages are variable rate loans. Only weeks ago the Valencian property developer Llanera collapsed, with £520 million of debts, hit by the credit crunch and higher borrowing costs. It also suffered from the oversupply of properties in Spain, which has an estimated 300,000 flats lying empty after a construction boom. In the meantime the Valencian Government is urging local councils in Almoradi and Los Montesinos to convert millions of square metres of rural to urban land in preparation for building. Alan & Jackie James from the Spanish charity AECC accepted a cheque for 1,020 euros on behalf of Mrs. Anne Rogers, who died on the 12th of July aged 63 following a 3 year long struggle against cancer. Anne only moved to Spain 4 years ago. She was a remarkable lady and an accomplished artist in oil colours. During her illness she never complained and stayed the same upbeat, pleasant and friendly person till the very end. The AECC is very closely involved in caring for terminally ill cancer sufferers. They visit homes and hospitals, and provide counselling for families affected by cancer deaths. After consulting Anne’s husband Peter, neighbours and friends at Villas Andrea decided it would be better to donate money to a charity rather than following the tradition of giving flowers. Husband Peter and their four children; Kevin, Tony, Jason and Julie backed the idea of raising money for a good cause. The collection of the donations was carried out by Jim Ryder. Anne’s family did not want the passing away of their beloved wife and mother to be remembered in the conventional way which was why the day Anne Rogers was cremated, there was a celebration of her life in a local restaurant. As friend Mel Leach recalls it:- it was not a gloomy gathering, but one where happy music and memories prevailed. The presentation of the cheque was part of a much more light-hearted event held on Thursday 20th September. The "Presentation Evening" for the Ladies' Darts and Mens' Pool competitions was attended by over 80 residents and friends from the urbanisation. On behalf of the family, close friend and neighbour, Jim Ryder thanked everybody who had donated to the charity. Alan and Jackie James did the same on behalf of the AECC. When it comes to parties, the Spanish are hard to beat. Last night we were invited to the Pedrera to celebrate the birthday of José who owns the site. Every Friday night a resident group perform live at the Pedrera. Last night the singer who had performed at Jim's birthday party joined them. So the entertainment was well taken care of. Everyone was given a free drink to start the evening, so the mood was happy. Later we were brought a selection of tapas at each table and then, at midnight, five very large birthday cakes were carried out into the room. Four were for José; the fifth one was for John Hatch who lives down the road and happens to share the same birthday. Neither of them were expecting such a wonderful surprise and both were suitably moved by the gesture organised by José's wife, Maria. Last week José donated 300€ of prize money to the ladies' darts competition and 300€ to the mens' pool competition . Since he has taken over the Pedrera, José has spent a lot of money improving the facilities. The next phase will see the opening of the new restaurant where the pool room used to be. With dark red walls, discrete lighting and chairs upholstered by José himself; the restaurant will, I am sure, be a very tasteful place to dine. I just hope that soon, José makes some profit out of a business which he has devoted a lot of time, money and heart to. Did you go to the opening of the new El Corte Inglés in Elche? By the time it was ready to open there were apparently hundreds waiting by the door. Some had gone to shop; many had gone just to see what the new building was like inside. By 10 o'clock 800 people had entered the store. By 11 you couldn't find a seat anywhere in the coffee shop. The first 2,500 customers were given a red rose. 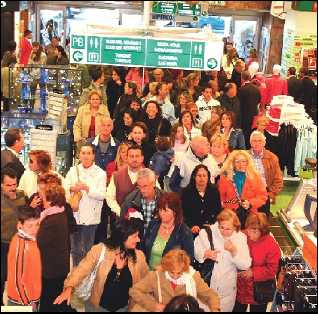 El Corte Inglés were expecting many more people to arrive later in the day and of course today it will be very busy. I'm sure it will be a good place to visit once things have calmed down. The Foundation Caja Murcía has signed an agreement with Town Hall to donate a vehicle special adapted for physically handicapped people. 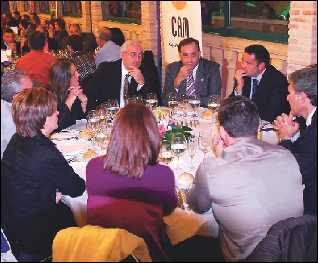 This week the CAM bank ,through its program CAM INTEGRA, also donated 9000€ to the Association Alzheimer of Bigastro. Now by my reckoning there are four other banks in Bigastro. I wonder. 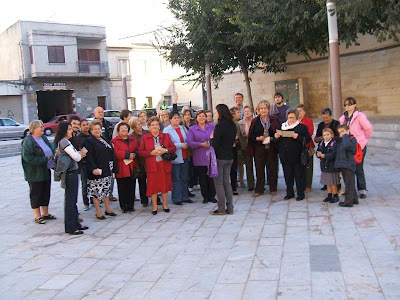 Students from the adult classes, run by EPA in Bigastro, visited Orihuela yesterday to expand their cultural knowledge. First stop was the Colegio San Domingo (on the Calle Adolfo Claravana) which dates back to the 16th century. This magnificent building houses both a school and a church with exquisite gilt and painted decoration. The party then moved on to the fascinating casa-museo of Miguel Hernández at Calle Arriba 73. Then they visited the gothic Cathedral which has its roots in the 13th century. Finally the party saw the beautiful pasos, that are paraded at Easter, in the Museo de Semana Santa. 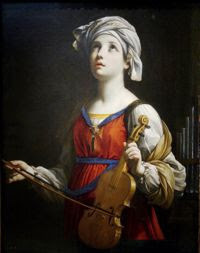 The Sociedad Unión Musical de Bigastro has published its programme in the form of a brochure which commemorates the festival of its patron, Santa Cecilia. In addition to the programme of concerts for the next weeks, the brochure emphasizes the effort, the comradeship, the participation and the "piña" that are essential components of the Society. These values are amply demonstrated in the photographs, performances, activities, etc. that are organised throughout the year: concerts, musical trips, contests, exchange programs , the School of Music, the creation of a Youth Band, music classes for adults, etc. The notice doesn't tell us where we can get a copy of the brochure. I imagine they will be available in the Auditorio Municipal "Francisco Grau" in return for a donation. The Council of Promotion in Bigastro has organized the seventh edition of the Christmas Window-dressing competition. The competition is open to all commercial establishments excluding bars, restaurants, companies in the industrial estate and municipal companies and will run from 15th November to the 3rd December. The City Council will grant a first prize of 300€, a second prize of 200€ and a third prize of 100€. I'm afraid a few strands of tinsel and a string of fairy lights won't even rate on the score card. Last year, the best efforts were very artistic. Last Saturday the 10th of November, a neighbor of the C/ Barrio Nuevo in Bigastro, Teresa Egio Mora, was pleasantly surprised to find that one of her hens had laid an egg weighing 171 grammes. Teresa said her hens had never laid eggs of this size before. She jokingly added that the egg will make a great potato tortilla. Of course it isn't just persimons that are in season at this time of year. The dates are ready for picking as well. 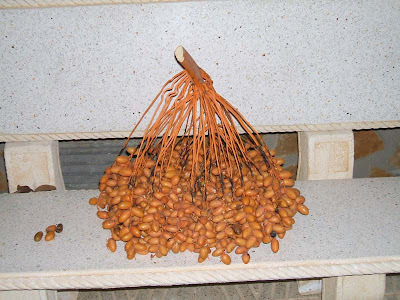 Those of you who live here or who have visited will have seen the large bunches of dates hanging from the date palms. They are nothing like the dried fruit that you buy in boxes for Christmas. These are plump and light brown in colour. Once they are cut from the tree they apparently need to ripen for a few days before they are ready for eating. We like dates but you do get rather a lot on each bunch as you can see! On Saturday I told you that I'd ordered "Identificación de llamadas" for my phone. Well, on Tuesday the service was activated along with "Identificación Llamada en Espera" and "Llamada en Espera". So now when you call me, your number comes up on my phone and if I'm out or don't answer the phone then the red light flashes to tell me I've missed a call. The phone now stores the last fifty calls that I have either made or received. This means that I can add caller's numbers to my directory and then maybe call them back. What I can't understand is why the services weren't activated by default. Why would you not want to know who was calling you? PS I've also activated the "short message service" but haven't worked out how to use that yet. Apparently Gordon Brown wanted people to suggest a motto which would capture what makes Britain great. “Britain, a terribly nice place”; “Less stuffy than we sound”; “Stubborn to the point of greatness” and “Turned out nice again”. "Great people, great country"; "Great Britain; Hail Great Britain! "; "Live, develop and flower; "A country so brave and true"; "Fairness for all" and "For honour and for freedom". Hinting at the fact that the country is actually run by a Scot. "Promoting ahistorical unity myths since 1066"; "West Lothian was my undoing"; "Britain will always be England" and "Britain is dead. Long live England". “Once mighty empire, slightly used”; “Your nation, ruined by Labour” and “Going down with Brown”. “Americans who missed the boat” ; "In America we trust" and “At least we’re not France”. "Yeah, but no, but yeah"; "Let’s discuss it down the pub"; "Robbin' hoodie and Jade Goody"; "Britain; Live wrong and prosper"; "Drinking continues till morale improves" and my favourite "Dipso, Fatso, Bingo, Asbo, Tesco". It is rumoured that the Prime Minister has now gone cold on the idea. Very sensible decision Gordon. On Tuesday, the Policía Local of Orihuela and officers of the Guardia Civil seized 34 packages totalling 1,100kilos of hashish with an estimated street value of over 500,000 euros on Punta Prima beach. A 19 year old Maghribian was arrested as the leader of the gang of six involved. The raid took place at 6am long before most residents would have been awake. 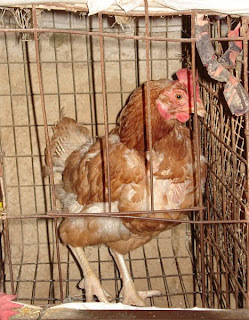 PS I bet the traffickers wished they'd understood the English saying "don't put all your eggs in one basket." I'm not sure how that translates into Spanish. 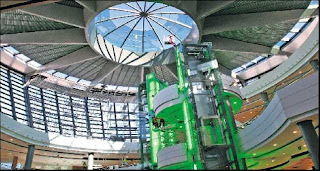 The new Centro Comercial Ciudad de Elche will be opened for business on Friday. Situated on the South ring road (Avenida del Baix Vinalopó 2), the new centre houses a three story El Corte Inglés and a Hipercor hypermarket. The car park has space for 2,450 cars so hopefully parking won't be a problem. Now we have the choice of El Corte Inglés shops to visit. The large one at Alicante which is on two sites, the smaller ones at Cartegena and Murcia or the new one at Elche. As in English, Spanish has some lovely little expressions which make the language interesting to learn. dar a luz ="give to light" used when someone is born. no he podiddo pegar ojo en toda la noche = "I had no power to stick eye in all night" means I didn't get a wink of sleep. para lo pequeño que es = "for the small thing that is" means as young as she/he is. estoy de morros = "I am the noses" means I am sulking. estar como una reagadera = "to be like a watering can" means as mad as a hatter. estoy hasta las narices de ti = "I am until the noses of you " means I've had it up to here with you. está como un cencerro = "it's like a cowbell" means he/or she are nuts. estoy hecho un lio ="I am done a lie" means I am mixed up/muddled. está como un cabra ="she/he is like a goat" means she is off her head (mad). uña y carne = "one and meat" means of the same flesh. en Navidad, las angulas estan por las nubes ="In Christmas, the eels are for clouds" means that at Christmas the price of fish always goes up (sky high). entre la espada y la pared ="between the sword and the wall" means between the devil and the deep blue sea. estan a partir un piñón = "they are to divide a pine nut" means bosom buddies. calado hasta los huesos = "soaked until the bones" means wet through. estoy sin blanca = "I am without white" means I am broke. The province has one of the worse indices of scholastic failure in all of Spain, with nearly 36% of its pupils failing to gain the minimum academic knowledge needed to move on to further study at the end of compulsory Secondary education. Less than 60% of secondary school student want to continue their studies at Baccalaureate level as opposed to 89.8% in the Basque Country, 80% in Asturias and 80.7% in Galicia. The average for the country is 70.5%. The last indices published by the Ministry of Education show that schooling of students between 3 and 5 years in the Valencian Community is at the third lowest level in Spain. In the Baccalaureate, the only area with lower matriculation was the the Balearic Islands, and in Programs of Social Guarantee the index of pupils is the worst in the country. The Professional Formation of average degree is the only level in which the Valencian Community surpasses the national average of 26.3% by 1.4% . In Superior FP the community is 1 point beneath the average of 23.4%, the seventh worse index in the country. It might be a good area for sunshine but not necessarily for education.
" SAXOPHONE DUO". José Manuel Bañuls Marcos and Vicent Minguet Soria. 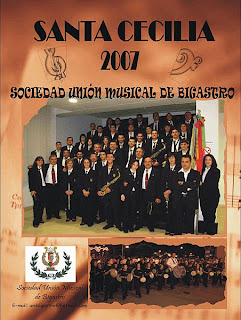 CONCERT BY THE MUSICAL GROUP " LOS MONTESINOS "
The Musical Group " Montesinos " was formed in 1983 and is directed by D. Sixto Manuel Herrero. The group, which has seventy musicians, organizes an annual Festival of Bands and has recorded a CD entitled "Prima Luce".
" EUPHONIC BASS QUARTET "
This group, which was formed in the Municipal Professional Conservatory of Almoradí in September 2006, is under the direction of Jose Antonio Mira and their repertoire includes, among others, works by John Stevens and W.A. Mozart. The Vega Baja has lost three thousand hectares of lemon trees in the last eight years. This is equivalent to 25% of the total production of lemons that the region produced less than ten years ago. The plantations of lemon trees have gradually been replaced by groves of oranges and clementines which are more profitable than lemons. For every euros worth of lemons sold at market, the grower only gets 10 centimes. The low yield of lemons, the bad quality of the irrigation water with high levels of salinity, and the competition from countries like Argentina and Turkey are driving agriculturists to move from lemons to other fruit. Even still, the Vega Baja produces 40% of the lemons that are cultivated in Spain. This situation has motivated the agricultural unions to demand central agricultural policies to assist lemon growers. Thirty percent of agricultural land in the region has already been lost to city-planning which has exiled the traditional orchard to bricks and concrete. They fear that if this trend continues then the character of the area will be changed forever. The persimon is sometimes called nispero here in Spain. This is confusing because they are actually different fruit. The nispero (or loquat as it is called in America) are small brown fruit with a stone whilst the persimons (or kaki) are bright orange with no stone. Ripe persimons are crunchy in texture; slightly sweet with a taste which is a bit like a cross between a mango and a peach. They are high in fibre and antioxidants so are definitely good for you. Too many though can induce diarrhea! 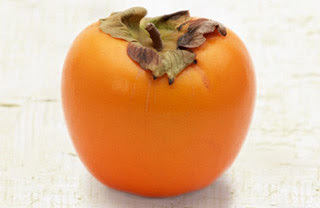 Persimon fruit are ready from about mid October so you should be able to find them on the market and in the shops now. They can be eaten raw or can be cooked. Although the skin can be eaten, persimons are normally peeled. They are definitely worth trying. Good grief, I think I have finally mastered my Telefonica phone. According to the English manual for the Domo phone you have to activate "caller line identification" . Without it the phone records the calls that you make but not incoming and missed calls. Yesterday, I managed to order CLID online by going into "Area Privado" with the username and password I'd been sent. I then selected "Telefonia" and "Servicios". Scrolling down I found "Identificación de llamadas" which is a free service; clicked on "contratar" and filled in the boxes with the information required and then clicked on "Continuar". When the details of my order appeared in a box on the screen, I clicked on the button at the bottom of the box to accept it. Bingo - I got confirmation that my order was complete. I also got an email confirming this. Hopefully I now have only to wait until someone at Telefonica activates it. 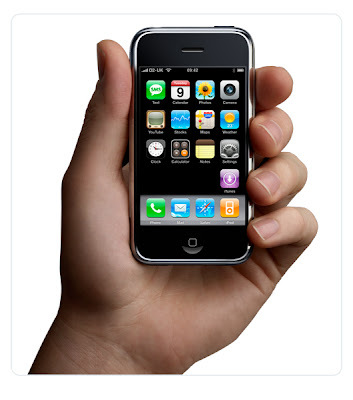 Telefonica are in discussions with Apple to bring the new iPhone to Spain. But it looks like those of you who are keen to buy the latest "must have" gadget will have to wait until next year to get one. PS Although I am known for my love of gadgets, this is one that I won't be buying. 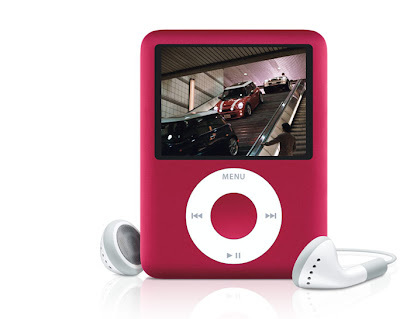 I use my mobile so infrequently, I couldn't justify the expense of an iPhone.I do like the new iPod nano though. I've put it on my list for Santa. Whilst we do most of our food shopping at Mercadona on the Crevillente road, we do like to buy some of our meat from the nearby Reeve's butchers. The shop, which has been open about two years now, is a great source for things like burgers, pies and sausages along with New Zealand lamb, thick cut pork chops and choice fillet steaks. They also sell seasonal products like mince pies and Christmas cake. We called in yesterday to buy a piece of gammon, some sausages and a couple of pies. They had the gammon along with plenty of other cuts of fresh meat but no sausages and no pies. The explanation was that they'd had a visit from Health and Safety who told them they could not sell meat products like pies and sausages without proper labeling in Spanish. There was also a problem with selling frozen meats so their chest freezer had been sealed up with tape. The only meat they had on sale were fresh cuts, labeled in both English and Spanish. Obviously any Spaniard shopping there would want to know what they were buying. A label that says "Huddersfield black pudding" (just typing that makes my mouth water) or "gala pie" won't mean much to a torreviejense. We understand the problem, we just hope they can sort it out soon. We want our sausages back! Why has my Impuesto sobre Bienes Inmuebles increased so much this year? Originally Urb. Villas Andrea was classified as "outside the town". The Valor Cadastral of our houses (which determines the tax we pay) was based on that. This year, Urb. Villas Andrea has been re-classified as "urban" hence the increase in the Valor Cadastral you will notice on this year's bill. In fairness though most of us were paying over £1,000 per year in Council Tax in the UK (almost ten times the amount we pay here) and what did we get for it? I don't know about you but we never had of the free things like fiestas or weekly concerts in the area where we lived. "A digital certificate is a file that is easily installed on your computer by means of a personal password. Once the certificate is installed you can make a number of procedures while sitting comfortably at home, not only with SUMA, but with many other organisations. This new way of being in touch with your local tax office can save you a lot of time." Just go to any SUMA office with your NIE certificate and you will be given a diskette containing your digital certificate and some directions to install it. It is very simple! Paying your taxes in Spain can seem confusing at first to we Brits. Leaving income tax aside because that is more complicated; in Alicante province SUMA are the organisation responsible for collecting local taxes. Impuesto sobre Vehículos de Tracción Mecánica (road tax) and Impuesto sobre Bienes Inmuebles (rates). This is some of the information available from SUMA's web site about these taxes. What taxes have to be paid in each period? • Impuesto sobre Vehículos de Tracción Mecánica [Road Tax]. • Impuesto sobre Bienes Inmuebles [Rates]. • Impuesto sobre Actividades Económicas [Trade Income Tax]. For this year, in Bigastro, the voluntary period for road tax was from 01/03/2007 until 04/05/2007 and for rates from 23/07/2007 until 05/10/2007. I imagine it will follow a similar pattern in future years. After the deadline of the period of payment, how can I pay the tax? , by using the different access methods available: Valencian Generalitat digital certificate or e-banking. In an ATM: CAM. I paid my tax bill correctly, in the proper period, but I have been notified as if I hadn’t paid . What can I do? You should contact SUMA personally or by phone. It would be useful to present a copy of the receipt paid or proof that the payment has been made.. If I have not received my tax bill, does it mean that I needn’t pay it? What conditions are applied to annual and other non periodic taxes? The taxes collected periodically are: The “Impuesto sobre Bienes Inmuebles” (IBI) [local property Tax], the “Impuesto sobre Vehículos de Tracción Mecánica” (IVTM) [Vehicle Tax], and the “Impuesto sobre Actividades Económicas” (IAE) [Economic Activity Income Tax], and certain other taxes which must be paid annually in the voluntary payment period. Taxes which are charged periodically do not require individual notification. All other levies due are notified individually and must be paid on the dates indicated in the notification. Any amounts not paid during the voluntary period will have a surcharge applied and incur arrears interest. How long should the bill receipt be kept? You must keep it for at least four years, which is the legal limitation period. What is procedure to claim a refund in case of overpayment? If you are asking for your money to be returned because the payment was duplicated, you will need to show the original copy of the second payment and a photocopy of the first one. If you are claiming money for undue revenue, you will need to provide the original receipt and a photocopy of the de-registration certificate issued by the competent authority. In both cases, the application must be made in writing and signed by the person named on the receipt, with a photocopy of his/her ID card and giving an account number into which the returned money can be paid, which must also be in his/her name. In the case of companies or company representatives, the application will be accompanied by a document proving this. NB If you pay your taxes by direct debit, it is worth keeping an eye on your bank statements to make sure that this has been done within the voluntary periods. We hope that the tidal surge on the east coast of Britain is less damaging than the forecasters have predicted. 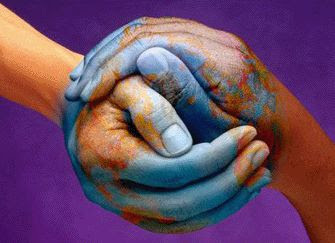 Most important, we hope that our friends who live on that side of the country are safe and well. ....if I had been the teacher in the story "Teacher in toxic shock"? I'd like to say that I would have felt compelled to take responsibility for the young man's education by demonstrating to him the right way to apply the cream. But, actually I would have stopped the performance before the young lady got the lad on his knees. Several years ago, I did have a similar incident in the classroom next to my office at school. A group of Sixth Form boys were working on their ICT projects in the room. When I went in to check up on them, a Sixth Form girl, who had nothing to do with the group, was on one of the tables taking off her clothes. I quickly dismissed the girl from the room. The interesting thing was that the lads hadn't even noticed what was going on. They were too engrossed in their ICT. The young stripper left school without a qualification to her name. I dare say it did her no harm though. She's probably enjoying a profitable career in the clubs of Liverpool earning more than all the boys in the class put together. 1. Cambodian police investigating the deaths of at least six people in traffic accidents have arrested a suspect - a cow. Pin Doman, a police chief based on the outskirts of Cambodia's capital, Phnom Penh, said the animal is thought to have caused a series of crashes over the past year. He said the cow's owner could also face a six-month prison term under a new traffic law that holds people responsible for accidents caused by their animals. The white 5-ft tall cow was standing in the middle of a main road on Monday when a 66-year-old motorcyclist crashed into it and died. It is not known whether or not the beast was injured. Earlier this year, the same cow was responsible for another traffic accident that resulted in the death of five people and several injuries, when a truck veered off the road and crashed as its driver tried to avoid the animal. Mr Pin said the cow was being held at his police station. He said the cow's owner had been warned four times in the past to keep his cattle leashed - and could face prison time if the relatives of those who died decided to initiate legal proceedings. 2. An American couple have survived unscathed after their minivan was crushed - by a falling cow. Charles and Linda Everson were driving back to their hotel when Michelle, a 600lb rodeo cow, landed on their bonnet. Amazingly, the beast had fallen 200ft from a cliff. Chelan County fire chief Arnold Bake said the couple missed being killed by a matter of inches in the accident near Manson in Washington State. The pair, who were visiting the area to celebrate their first wedding anniversary, were taken to hospital but later released. Unfortunately, Michelle was not so lucky. She had to be put down. Mr Everson, 49, said he was in shock as he watched the bovine bounce off his battered bonnet. He told the Detroit Fee Press: "I'm just glad to be alive. It's raining cows out here, man!" The chauffeur said he saw something hit his vehicle but amazingly kept on driving for a mile before pulling over. "Wham! It happened so fast I actually thought it was a deer," he told the paper. "All of a sudden I'm looking at it, and I tell my wife, 'It's a cow,'" he said. "I kept saying, 'I don't believe it.' I must have said that 20 or 30 times." Chelan County Sheriff's Sergeant Mike Harris said the animal was a Professional Bull Rider-registered cow that had escaped its ranch about a month ago. "It was bred for rodeo," Sgt Harris told the paper. "It was not your normal cow in a field." Sunbathing can slow the ageing process by up to five years, according to new research. Scientists have found that people who avoid the sun, or have inadequate vitamin D in their diet, are subject to genetic damage associated with ageing and age-related illnesses. The effect of the damage is so great that those who lack vitamin D - often called the "sunshine vitamin" because 90 per cent of the body's intake is created by exposure to the sun - were biologically five years older than those with the highest levels. Co-author of the report, Prof Tim Spector of King's College, said the study showed people should spend more time in the sun and eat more foods rich in vitamin D such as fish, eggs, fortified milk and breakfast cereals, or take supplements. Does that mean that Pam and I are now biologically 55? A mother booked a special performance for her son's 16th birthday. She stipulated that the surprise take place in drama class at Arnold Hill School in Nottingham and even asked the teacher to film it so the family could see the boy's reaction. But, thanks to what has been put down as a booking error, a female stripper turned up in place of the gorilla-suited man the unnamed mother had apparently asked for. The stripper, who arrived on cue halfway through the lesson, first walked the birthday boy around the classroom on all fours. Then, gyrating to the sounds of Britney Spears, she spanked him before stripping down to her bra and knickers and insisting the "naughty" schoolboy rub cream all over her body. At that point, the teacher (who had not been told what the surprise would entail) called an immediate end to the show. When I was a teacher, I would have lived off that story for years. The concerts this weekend at the Auditorio Municipal Francisco Grau feature young musicians from the town. Pilar Sáez, Raquel Diaz, Alexander Ortuño and Marina Reina. The Eee PC defies all expectations, particularly for a device that's nominally aimed at children. Normally, the smaller the laptop, the more expensive it is. But the Eee, at £170, costs less than any other laptop or even desktop on the market and it isn't a toy! For tapping out emails, working on documents and surfing the Internet, the Eee PC is all but perfect. It measures just 225mm wide and 170mm deep. Including its power adapter it weighs only 1.12kg. Without the power adapter it weighs a mere 928g. The operating system of the Eee is built on the back of a Xandros installation of Linux. It sports a tabbed main interface; along the top of the screen you can select from Internet, Work, Play, Settings and Favourites tabs, each with its own selection of applications and links to online resources. OpenOffice 2.0.4 (office suite) and Firefox 2 (web browser) come pre-installed. In keeping with the Eee's aim of being as easy to use as possible. These are simply described as "Documents" and "Web" in the Eee's OS interface. Both are full-blown installations, not cut down versions. There is nothing the Windows version of Firefox could do that can't be done on the Eee, including handling rich websites such as YouTube. Mozilla's Thunderbird (email program) is also pre-installed but is placed under the "Work" rather than "Internet" tab. The only usability problem is presented by the low-resolution screen. 800 x 480 feels rather cramped and the 7in diagonal isn't perfect either. It's enough for only 18 lines of 12pt text in OpenOffice. You should forget the Eee if you're looking for something to work on large spreadsheets. On the plus side, the screen is bright, clear and reproduces colours well. The cramped conditions do affect the tiny keyboard: each key has about the same surface area as a fingernail. Getting up to full speed takes a concentrated half hour of practice. The trackpad is similarly restricted but works perfectly well. The only real problem is the operating system's disk footprint. The Eee has a 4GB flash disk instead of a conventional hard disk, and at 2.5GB the operating system consumes over half that capacity. That means you'll never be able to install any recreational media like videos for example. But there is more than enough space for hundreds of office documents. You can, of course, add a USB flash drive to expand the capacity. Between that and the ability to connect to both wired and 802.11b/g wireless networks, there's little to stop you expanding the storage externally. As the icing on the cake there's even a 640x480-resolution webcam set into the bezel. The Eee feels unflinchingly solid, the keyboard has a reassuringly firm base, and there's virtually no give in the screen's mounting. The lack of moving parts - with a solid-state disk and the lack of an optical drive - make the Eee at least as shock-proof as its ultraportable competitors. In tests the battery ran, under light use, for a respectable 3hours 31 minutes. So if you are looking for a simple, cheap but effective laptop for your children (or for yourself ), the Ee Pc from Assus is well worth considering. The spokesman for the PP in Bigastro, Aurelio Murcia, has put into the hands of lawyers the possibility of denouncing in court the PSOE for breaches of contract in their electoral manifesto. Murcia believes that the electoral program of a political party is is a moral contract made "with the citizens " in exchange for their votes. It appears that the socialist mayor, Jose Joaquin Moya has approved the " update " of the tax on vehicles in most of the categories with the exception of motorcycles. He has also increased the quota of the municipal day-care center from 90 to 110 euros. In Murcia's eyes, Moya has failed to fulfill his electoral promise to maintain the previous levels. Murcia said, in a press conference, that the PSOE knew before the election in May that the City council was " stiff " (of money) and did not have to include those promises in their programme. The PP was also aware of the fiscal problems that the town faced and so did not make those promises. Murcia admitted that he doesn't know if a court would consider the manifesto of a political party to be a binding contract. The truth is that he knows the case doesn't stand a chance in court because, if it did, then political parties throughout the world would be forever facing a judge. What Murcia is doing though will bring the problems he perceives with the current administration sharply into focus. The update to vehicle tax comes alongside a rise in the coefficient which is applied to calculate the final figures. So we can expect a rise in car tax come March. I have to say that, in comparison with UK Road Fund Tax, the tax on cars here in Spain is very low. The Association of Relatives of Patients of Alzheimer along with the Council of Social welfare has planned a day when relatives and partners of this association can get together. The date set for this event is Sunday 11th of November. The object is to recruit people and to help to finance the activities that this bigastrense association is carrying out. There will be a meal served at 2pm in the Salón «Las Dos Rubías» (Crta. Zeneta - El Mojón). Anyone interested can buy a ticket at the Seat of the Association, which is located in the Centro Social Integrado; Monday to Friday from 9am to 2pm or Monday to Wednesday from 5pm to 7:30pm. Tickets, including the meal, will cost 35€ per person. Tickets will also include a raffle for a jamón. Thirty people working in the kitchen at the Sagunta hospital won 41 million euros on the Euromillion lottery with a 42 euro bet last Friday. That is equivalent to nearly 7,000 million pesetas or 200 million pesetas each. 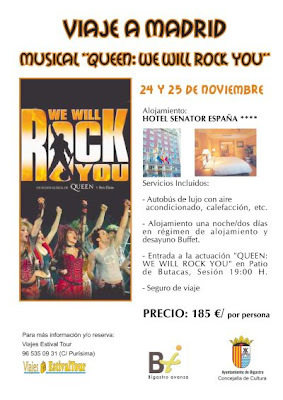 The Council of Culture of the City council of Bigastro has planned a trip to Madrid to see the new musical comedy, " QUEEN: WE WILL ROCK YOU ". The trip is scheduled for the 24th and 25th of November. For the last seven years, the Wesenauer family has been fighting against a decision which will see their garden completely destroyed by developer, San Jose, and a three storey apartment block erected within 5 metres of their 150-year-old finca in Lomas de Don Juan, Campoamor. To add to this family’s misery, the constructor is demanding 44,000 euros to cover the infrastructure costs of the new development, a sum they cannot afford to pay. Under the abusive Valencian LRAU Land Grab Law, the constructor, San Jose, is allowed to effectively steal a portion of the Wesenauer’s garden, providing the land grab will be of benefit the local community. The EU has declared that LRAU is unjust, and since its introduction in 1994, there have been some 30,000 denuncias regarding this law in the Costa Blanca alone. While anyone can call themselves an ‘urbaniser’ and apply to grab someone else’s land, there needs to be a benefit to the community as a whole, and the decision to licence the build ultimately rests with the Town Hall. It is hard to understand how building more holiday apartments will benefit the community but, as the Wesenauer's have learnt, once planning has been granted it is almost impossible to get the decision reversed. "Un grupo de residentes ingleses de Bigastro, aficionados al golf, han creado un blog en Internet para mostrar en imágenes todos sus torneos." This is the blog created by Les Rowlands for the Bigastro Golf Society which numbers both English and Spanish players. You'll find a link to Les' blog (no pun intended) in the left sidebar under Blog Links. The Moroccan Government is apparently incensed by the official announcement on Friday that the proposed visit by His Majesty, King Juan Carlos I on the 5th and 6th of November to the two Spanish occupied cities of Ceuta and Melilla will go ahead. From Spain's point of view the visit, which follows the one by Jose Luis Rodriguez Zapatero last year, is " logical and natural " . Spain feels that it would serve to establish mechanisms of collaboration between Spain and Morocco to both improve the relations between the two countries. The Morrocan Government says that the decision to go ahead with the visit has been taken after very high instructions (sic) from His Majesty, King Mohamed IV to the Spanish Government telling them to cancel. Morrocco disputes the fact that Ceuta and Melilla are Spanish in the same way that Spain disputes the fact that Gibraltar is British. I'm afraid Spain, that you really can't have it both ways. The plenary session of the City council of Bigastro unanimously showed total and absolute rejection to the planned section from Comunidad Murciana - Catral of the Autopista del Reguerón, toll autopista (AP-37) Alicante - Murcia if it is about to to try to follow a straight line through the huerta ( the traditional orchard). The same plenary session applauded the the plans to construct an autopista between Orihuela and Guardamar CV-91 which the Generalitat has posponed. This autopista del Reguerón project is in its first draft. The proposal to build this road has generated a lot of social debate in the Vega Baja. It would be the fifth autopista in this region. The planned 20 kilometers road would run parallel to the Reguerón to Hurchillo (Orihuela), through the huerta of Bigastro and then on to Catral. The autopista AP-7 runs from Albatera to Santomera (Murcia), the toll autopista Alicante-Cartagena runs from Catral to Pilar de la Horadada. The Generalitat has approved the construction of the autopista from Orihuela to the Coast passing by Hurchillo, the land outside Bigastro (Orihuela), Jacarilla, San Miguel de Salinas and Torrevieja at Los Balcones. It almost seems that any land that is not covered in concrete will be covered in tarmac. Security restrictions at UK airports mean passengers may only carry a single piece of hand luggage onto a flight, forcing them to cram items such as handbags and laptop cases into a single larger bag. The unpopular controls have been blamed for adding to delays at busy airports like Heathrow. BA chief executive Willie Walsh is optimistic that the "hassle factor" of the one bag limit may be ended by the government before Christmas. Hoorah. It seems absurd that you can only take one piece of hand luggage through the security check and then once through you can buy any manner of goods, including restricted items like lighters and bottles of liquids of all descriptions from the duty free shops to take on the plane. In our experience the "hassle factor" has been made worse by "jobsworths" who apply the rules in an arbitrary fashion much to the annoyance of passengers. The Franco years will become just a memory following the law which was past yesterday ordering any references to the dictator to be removed from public places. The statue of Franco in Madrid was removed in March 2005. Now streets will be renamed and other references removed including plaques and insignias. Those who had relatives killed during the regime will be allowed to exhume bodies from the mass graves. The exception to the law will be for architecture and symbols of artistic merit in churches. Yesterday, the judge, Gómez Bermúdez concluded the sentencing of 21 of the 28 accused of plotting and executing the Madrid train bombings in 2004. Although three received sentences of thousands of years, others will be imprisoned for as little as seven years. The suspected ring leader, who materminded the bombings, was among those acquitted but is coincidentally on trial in Italy for belonging to a terrorist group. In his conclusion, the judge ruled that there was no evidence to link ETA with the Madrid bombings. Survivors and the families of those killed have reacted angrily at what they call lenient verdicts against those found guilty and the acquittal of seven suspects. Spain's prime minister Jose Luis Rodriguez Zapatero welcomed the sentences, but the opposition's Mariano Rajoy was critical. He said his PP party "would back any further inquiry that would allow justice to be made, because the masterminds of the attacks had still not been sentenced". Some of the suspected masterminds are believed to have fled the country while several others blew themselves up weeks after the attack. Victims Association leader Pilar Manjon has said they plan to appeal the verdict. "We will go to the Supreme Court with all the arguments our lawyers can find once they have studied the verdict thoroughly," she added. "The verdict is too lenient considering what these people have done," said one survivor. The judge also announced compensation for victims ranging from 30,000 to 1.5 million euros. Nearly 2,000 people were injured in the March 2004 attacks on commuter trains in Madrid which claimed 191 lives. 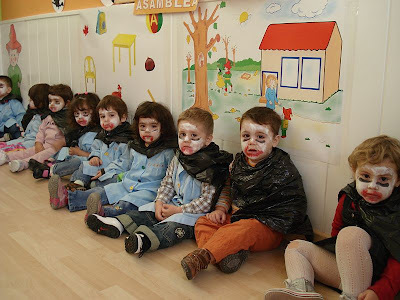 The Municipal Infant School " Bigastrín " celebrated Halloween. As you can see the children painted their faces. They also had decorated pumkins and played ghost games. They don't look very happy though.